Calvary loves having children in worship because we recognize children as full members of the body of Christ. We take seriously the Baptismal vow to corporately care for the souls of ALL of our children (young and old!) Author Marjorie Thompson writes that we “gather for worship to remember who and whose we are.” And our children need this as much as we do….even though it feels like we’re not getting anywhere some Sundays! When children worship with their parents it builds their identity as being part of a community of faith. Children see their parents and other adults live out the priority of family and faith. Worship slows us down. In our fast-paced world, we are no longer in control of our time. In worship we are forced to move at a rhythm that is not natural for us – and especially isn’t natural for children! In the slowing down, spiritual formation happens. Children need role models to show them how to do this, and who give them permission to be still. And here’s the big one: children are transformed spiritually – and so are adults– when they learn that following Jesus is not always convenient. Both children AND adults are spiritually formed when they practice with the full body of Christ the rituals and rites that pass on the values of Jesus. 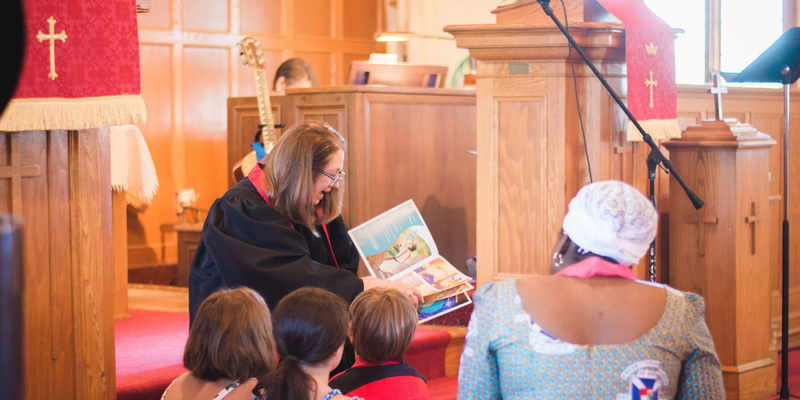 Children begin worship with their parents, and Pastor Michelle will call them forward for a special message for them. Afterwards, children may rejoin their parents, or may be dismissed to “Activity Time” with Verona and Hope. We do not believe that the seeds of faith are best planted by the “spiritual experts.” First of all, we don’t claim to be experts but rather followers, learning as we go. We believe t parents are best suited to nurture the faith of their children, and we want to put resources in your hands so that you can take advantage of the opportunities that arise during the day to weave faith into the fabric of your family.